Click on the green flyer to read about our new expanded childcare that starts at 8:45am, leading up to our main groups. The Beth Jacob Youth Department is led by the talented Yisroel and Malka Weiser. 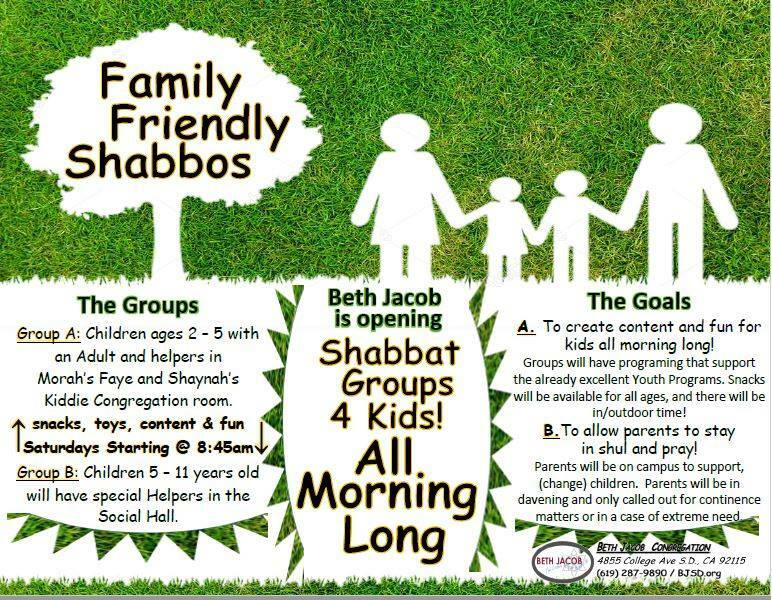 Beth Jacob offers a vibrant Shabbat Morning youth group program for children ages 3-12 spanning from pre-Nursery through seventh grade. The program, which meets year round on Shabbat and Yom Tov, begins at 10:15 AM and concludes at 11:15 AM. Times are extended when needed. The goal of the program is to provide children with a fun, informative and educational experience all based on Torah values. Group 1: TOTS - Nursery and Pre-K with Morah Faye Snyder and Morah Shayna Adelman. In these groups, Divrei Torah are shared, stories are read, songs are sung and all varieties of games are played. Shabbat stories and songs are par for the course. The BJC Youth Group Program provides children with an environment filled with fun and learning. If you haven't tried us yet, give us a try. You'll be in for a treat! For grades 3-7, boys and girls. Mr. Yisroel Weiser teaches children how to pray, lead prayers, read from the Torah and deliver inspiring Divrei Torah. The program concludes with a delicious Ice Cream treat.